In 2005, Caitlin Stern finished her undergraduate degree at Harvard University and was hired as a field assistant at the Hastings Reserve by Prof. Janis Dickinson, Cornell University. Caitlin’s studies focus on the behavior of the western bluebird. Several birds that are blue live in Carmel Valley, but in the highlands, there are Western Bluebirds, related to other thrushes, including robins. 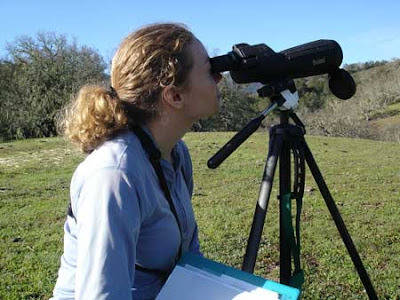 Now a doctoral candidate at Cornell, Caitlin is in her 4th year of fieldwork in Carmel Valley. A quick look at a few bluebird nests may suggest that monogamous pairs of males and females raise broods of young alone, but careful observations of which birds are coming and going reveal a more complex social organization, as Janis Dickinson’s previous work has shown. Both juvenile and adult offspring may stay around to help their parents raise younger siblings, and brothers or sons nesting nearby may return to help if their own nests fail. Additionally, both members of a pair may pursue sneaky matings with individuals who are not their social mates. Figuring all this out takes time staring through a telescope to get quick glimpses of the colored bands on the legs of the bluebirds. Caitlin is developing an ingenious bird detection system to record visits to the nest box that may have previously gone undetected. To track the birds, Caitlin wound wires into hexagonal antennae that can be placed around the entrances of the bluebird boxes. A radio-frequency identification (RFID) tag, a small electronic tag like those used to mark pets, is attached to the bird’s leg bands. Each tag is unique. 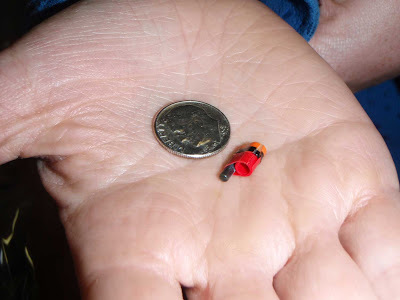 Every time a tagged bird enters or exits the nest box, the antenna will pick up the tag’s number, and the RFID reader will store that number, along with the date and time of the visit, on a memory chip. Every visit to a nest box, no matter how sneaky, is recorded. Eli Bridge, a post-doctoral researcher at the University of Oklahoma, conceived of and designed the electronic system Caitlin is using. Eli is also collaborating with David Bonter, the Assistant Director of Citizen Science at the Cornell Lab of Ornithology. Funding from the National Science Foundation has made this research possible. This leg tag system has uses for studies of birds or other animals and should be of interest to many field biologists. In the meantime, Caitlin is setting up 40 nest boxes with these detection systems and will be collecting reams of data on who is visiting whom in Carmel Valley’s western bluebirds. Western bluebird in hand, with uniquely colored band on leg. The band also carries a radio-frequency identification (RFID) tag. Both are unique and indentify this particular male bird. 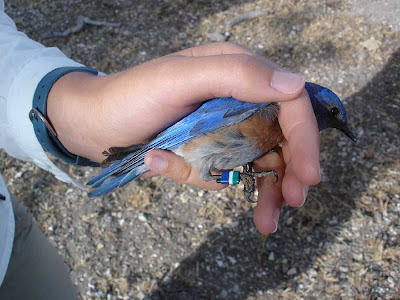 Colored leg bands with attached RFID tag, ready to be fastened around a western bluebird’s leg. 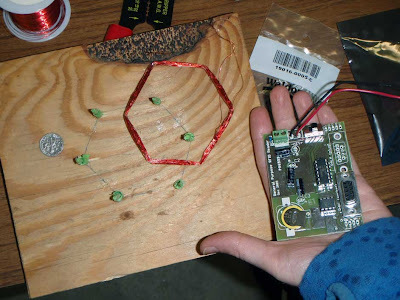 Loop of wires wound into antenna and small RFID reader. The antenna is placed around the entry hole in a nest box, and the bird’s movements (in and out) are recorded.